The PTFE Coated Fiberglass Tape' material is made of the selective glass fiber, using the most advanced weaving equipment, weave into fabric with a variety of thickness, and coat PTFE resin onto the fabric in a sophisticated way. It is a new product with high performance, Multi-purpose compound materials. It has two types: one has release liner, the other hasn’t..
1.The using temperature is between -60 °C -260 °C, weather-resistant & anti-aging. 7. Resistant to tearing, puncturing and abrasion. 8. Easy to use, long service life. B:Food, dairy products, pharmaceuticals of plastic film bags hot sealing pressure sticky. 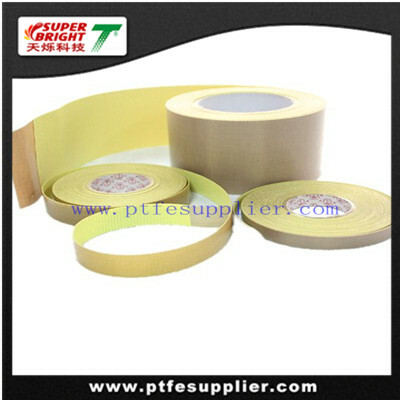 F: As insulating liner, insulation parts of the insulation encapsulation etc.